When the weather in Ottawa finally warms up, eager members of OSBA group have been gathering for a few hours each week to socialize with other members, to sketch outdoors in relaxed surrounding and be entertained by the numerous little animals and birds. The outdoor sketching group has had it challenges this year. Compared to last year where we were able to have our outings, pretty much, every week and going until mid-October. This year, though, we had been haunted by the rain gods who seem to have been soaking up just about every Wednesday and Thursday all summer. With that being said, Inga Legere, the Sketching Co-ordinator and part-time weather reporter, did managed to put together a handful of sketching get-togethers. We would like to thank volunteer Isabelle Nicol, Backyard Garden Manager, at the Fletcher Wildlife Garden for making us feel right at home in the backyard garden. 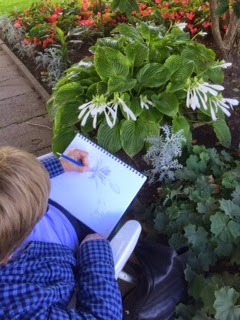 We also managed to get a few sketching days in at the Ornamental Gardens at the Experimental Farm.